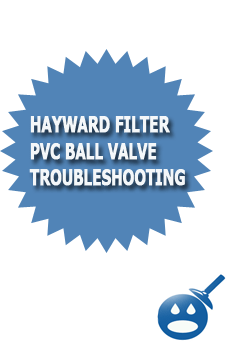 If you own a Hayward Pool Filter that has a white PVC ball valve on the filter tank and you are having trouble with it, then you made need to troubleshoot, rebuild and repair the inner workings of the valve or simple replace the valve. The white PVC ball valves can be found on many makes of the Hayward Pool filter but is most commonly used on the Perflex filter line like the EC40, EC50, and EC65A pool filters. Sometimes the valves will get stuck open, they will continue to drip after they are in the close position and one of the most common problems is that the valve handles will snap when then are turned if the valve gets jammed up with debris. Most of these problems can be fixed in a few minutes with a pair of pliers and some water. How Can I Stop My Hayward Valve From Dripping? If you have tightened down the plastic ring and placed the valve in the off position and you are still see some water drip or flow out of the other side of the Hayward valve you can take a plastic Hayward plug with the o-ring built in and screw that firmly into the end of the valve which will be threaded. If you have a backwash line fitting screwed into the valve end you will need to remove that first before you can screw in the plug with the o-ring. How Do I Replace My Hayward Ball Valve? Replacing the white plastic 3 piece Hayward filter ball valve is easy to do and requires only a few tools and a few minutes of time. You will first need to shut down your filter system. Once the filter system is shut down you can then remove the old filter ball valve by spinning it to the left which is counter clockwise. You will need to spin the valve until its free from the filter tank. Once you have removed the old Hayward ball valve from your filter you then will want to Teflon tape the threads of the new valve and then spin it into the filter tank. If you have a backwash line, you will want to spin the back wash line fitting into the other end of the filter valve. How Can I Open & Close A Stuck Valve? If your white plastic Hayward PVC ball valve is frozen or stuck in one position then you can loosen the lock nut ring that is on the valve. If you look at the center of the valve you will see a large nut. If you loosen this nut it will allow the inner parts of the valve to free up and you should be able to close the valve. In some cases your valve handle will be broken, so instead you can use a pair of pliers or channel locks to turn the valve stem. Can I Clean & Rebuild The Hayward PVC Filter Ball Valve? 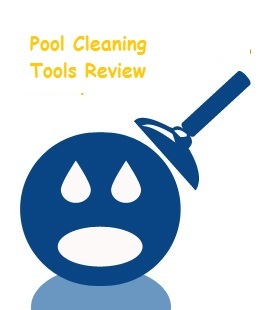 If your ball valve is still in good condition and you feel that it may just need to be cleaned out or slightly rebuilt, well you can do so by taking it apart. If you spin the valve out of the filter tank and then loosen the center nut you will be able to remove the ball from the valve and also be able to wash out the inside of the valve body. Most of the time old D.E will cake up inside the ball valve causing it to be stuck or not to be able to be closed all the way. A simple breakdown and cleaning of the ball valve can get your Hayward ball valve working again in no time.